In a future war, a cowardly soldier is forced to live out the same disastrous day over and over. In the near future, a meteor crash lands in Germany, unleashing an invading alien force, who come to be known as "mimics". An International Defence Force is assembled to deal with the threat but continental Europe quickly falls. With Britain the last nation holding out, a D-Day style landing on the beaches of France is planned as Earth's last hope of victory. Thanks to a massively successful propaganda campaign - focused on the exploits of a heroic female soldier (Blunt) - devised by former ad exec Major William Cage (Cruise), millions of willing grunts have signed up for the mission, but when Cage is ordered to take part himself, he unsuccessfully attempts desertion. Thrown into a disastrous battle, where the IDF forces walk straight into an ambush, Cage is killed within minutes by a mimic, but wakes up at the beginning of the very same day, which repeats itself exactly how he remembered. Unless he can find a way to defeat the mimics, Cage is doomed to live out the same fatal day for eternity. 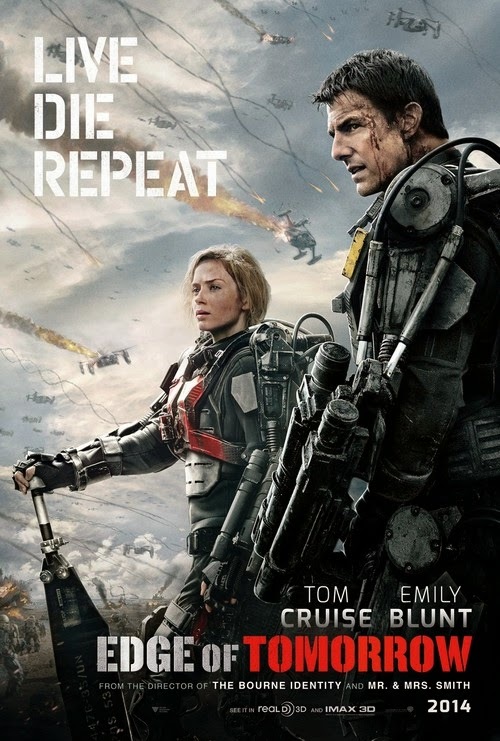 If you think Edge of Tomorrow, adapted from the novel All You Need is Kill by Japanese author Hiroshi Sakurazaka, sounds like little more than a blending of Groundhog Day and Starship Troopers, you're not wrong. It may not be an original idea but it's certainly a novel one, and director Doug Liman, along with writers Christopher McQuarrie and Jez and John-Henry Butterworth, exploit the concept to its full potential. Cast against type, Cruise's William Cage begins the movie as the type of cowardly nebbish Bob Hope might have played in the 1940s, or Woody Allen a generation later (Cruise's interactions in this near future world are not unlike Allen's in Sleeper). Blunt plays the straight man to his comic foil in a convincing manner, leaving us in no doubt as to who wears the trousers in this relationship. The pair play off each other brilliantly, with Cruise displaying a knack for comic timing than will surprise his many harsh critics. We haven't seen this dynamic work so well since Charlie Sheen played off Nastassja Kinski in the under-rated Terminal Velocity 20 years ago. He may be a limited actor, but none of his peers can touch Cruise when it comes to being an old-fashioned matinee idol. Here he's given the type of role a movie star requires; one that plays to his strengths. Seeing the 51-year-old Cruise indulge in Marty McFly style shenanigans makes us pine for the career Michael J Fox might currently have, had nature not struck him a cruel blow. Even the famous Cruise smile plays its part in the comedy, as Cage attempts unsuccessfully to charm his way out of dangerous situations. If you're one of those odd people who hate Cruise (the reasons seem to be a ludicrous mix of religious bigotry and sizeism) then you can at least bask in seeing him killed repeatedly here. Like a human Wile E Coyote, Cruise has a series of metaphorical anvils dropped on him, with hilarious results. I haven't laughed so much at gruesome deaths since the early installments of the Final Destination series. Often his demise comes at the hands of Blunt, usually out of necessity for the mission, but sometimes simply because he's getting on her nerves. Turkeys like Mr and Mrs Smith and Jumper have badly damaged Liman's reputation; a shame, as with early gems like Swingers, Go and The Bourne Identity he proved himself skilled at delivering on the dual fronts of comedy and action. Here he combines both disciplines to wonderful effect, and the result is the most enjoyable blockbuster to come out of Hollywood in quite some time. Credit must also go to McQuarrie and the Butterworths for giving us a script so coherently and simply plotted it allows us to switch our brains off and enjoy the ride. Let's hope other Hollywood scribes are taking note.